The ‘hot desk’ model is a method of managing office resources in which workspaces are not allocated to specific members of staff. 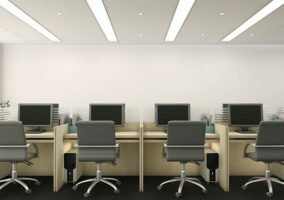 Rather than be assigned a desk which they use exclusively, staff members can use any available workstation. When one employee finishes their shift, the workspace is available for a different employee who is beginning theirs. This requires less physical space, which is often at a premium in city locations. Additional savings are also made on resources such as telephony and computing equipment. The average reported value of these savings is around 30%. There are various ways a business can approach shared workspaces. The most straightforward option is to have agents simply take any desk that is available, usually within a defined space for their team. This requires very little management but has been known to lead to tension between employees who expect to be able to claim a favourite area. 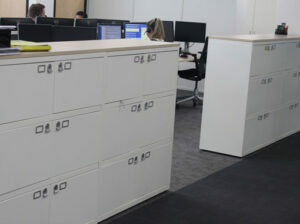 A more involved option uses a computer to distribute desks to incoming agents, either randomly or to a pattern favoured by planners. The technology that does this will be familiar to call centre managers, as it operates along the same lines as an ACD. Most companies that provide hot desks have lockers where employees can keep their personal items and files. Some planners report that group cohesion is negatively affected because the close relationships between colleagues who work next to one another cannot form. However, while there may be fewer very close connections, there are more total connections. This could arguably improve group dynamics by encouraging staff to communicate with more of their colleagues. Hygiene is an important consideration, and staff in a shared office are well advised to wipe down computer and phone equipment with antibacterial cloths. To control rates of illness, offices might need to provide wipes and hand sanitisers. Employees who have no sense of ownership over their space may feel less motivated to maintain it; clean-desk policies help to make sure standards are kept up. That is not the only consequence of the lack of ownership – one major impracticality of using a hot-desk system is that employees are not able to customise their workstations. Displaying personal items such as family photos is good for morale and makes the office environment a more pleasant place to be. There are also essential work items that many office workers choose to keep to hand, such as information on key processes and contact details for business partners. In contact centres with excellent reward and recognition schemes, the high visibility of certificates, trophies and prizes are part of the broader reason for rewarding people in the first place. 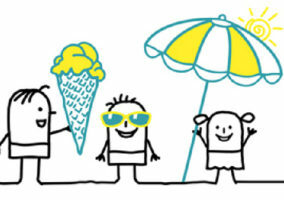 There are also adaptations related to health and safety, and disability. Many office workers rely on footstools, specialist mouse pads, keyboards, back rests, and other chair adaptations. It is highly impractical to remove all of these at the end of every shift, and the only real solution is to exempt certain people from hot desking. This undermines the cost-saving purpose of the strategy, and will likely leave those staff with extra requirements feeling exposed.